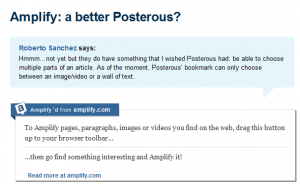 I was posting to a discussion about Amplify being a “better Posterous” and decided I would share it here on my blog also for the people who follow my blog. I basically moved from “living” on Facebook and Twitter to Amplify this week. I still access Facebook and Twitter in fact in ways the move has enhanced my experience. Here is the post, there is a link after to the original thread if you want to see what others have said. Wow great discussion! The hook for me that exceeded Facebook, Twitter, etc. was the fact that there is a GREAT community interaction and the site is absolutely unique in what it can do right now. Of course over time I am sure the team here (and elsewhere) will work to innovate and disrupt but I hope that amplify will continue to build on the strength of the conversation portion. Prior to making Amplify my home, I bounced between Facebook and Twitter. For me this was a really simple shift because I can still selectively engage those audiences but also just casually share the stuff that I read throughout the day. 1. I made some great Quality friends quickly (the site attracts energetic, kind, supportive and savvy people). 3. It encouraged me to use a couple of other sites a little more (sites I was basically passively updating already via ping.fm) Friendfeed, Posterous. In summary Amplify is a site were individuals of all skill levels can effectively communicate without being forced into a closed system (like Facebook). In my view it has the most important aspects of Twitter, Facebook and Friendfeed right now. It will also truly “amplify” the effectiveness of your message, ideas and experience. I just moved this article over from my old personal blog due to the Haiti crisis. Here is a brief podcast followed by the original article. I believe this quote identifies an important part of human nature that every single one of us will struggle with in our lives. In the face of human tragedy or extremely disturbing situations we often feel powerless or over-whelmed and do not know how to respond – so we do nothing. A perfect example is when we are a witness to an auto accident, it is our legal and moral responsibility to stop but how many cars zoom by and do nothing with drivers confused and un-sure of how to respond. Understanding this can lead to a very reasonable outcome – being prepared. You are on a train and a passenger collapses to the ground near you. A patron in line in front of you gets very verbally abusive and threatening to the cashier. You witness an automobile accident and several cars in front of you do not stop. By preparing and visualizing, it is much easier to do the right thing when you face the situation in real life. Item #2 was a real world example for me; I was in an office supplies store when this occurred. I did not intervene but I was mentally preparing myself for what I would do if the situation escalated beyond threats to actual violence. Had I not had a chance to prepare, what would I have done? Hopefully the same things I had planned to do if it had. If you like what I’ve said here I would recommend you visit a local service club, for selfish reasons I will recommend Rotary. I have been a part of the Danville/Sycamore Valley Rotary club for over 2 years and it has definitely given me inspiration to build a lifetime of happiness. Over the years many of us have acquired a variety of cell phones and we sometimes wonder what the heck to do with them. The batteries can be hazardous to dispose of and it just seems so wasteful to throw them out! There is an organization named Call to Protect (www.calltoprotect.org). It is organized by a wireless foundation, Motorola and the National Coalition Against Domestic Violence, that collects used phones for battered women’s shelters nationwide. The phones are repaired and programmed to call emergency numbers in the area they are distributed. Your old phones can now mean comfort and safety for a victim of domestic violence. I just boxed up three phones to ship to Call to Protect, and I feel great about it. They are, after all, for a truly worthy cause.